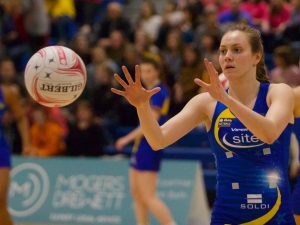 Team Bath Netball showed tremendous character to turn a six-goal deficit into a 51-47 victory over Strathclyde Sirens tonight as Blue & Gold supporters were treated to another rip-roaring Vitality Superleague clash at the Team Bath Arena. The noisy four-figure crowd saw the Sitec-sponsored Blue & Gold struggle to find a way through Sirens’ rock-solid defence during a feisty and physical first half, which saw the visitors lead 15-9 at the end of the opening quarter and hang on to a two-goal advantage going into the interval. Team Bath stuck with the gameplan, though, and eventually managed to pull ahead in the third quarter before seeing out a hard-fought victory – their fourth in a row as they keep up their chase for a top-four finish. 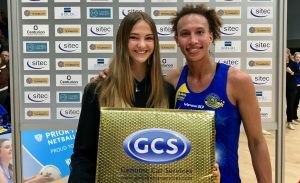 England star Serena Guthrie played a key role in the comeback with some outstanding interceptions and was named as Genuine Car Services Player of the Match. “It’s not easy to come back against a classy side like Sirens so we’re happy to come out with the win but there is a lot of learning for us to take from the game,” she said. 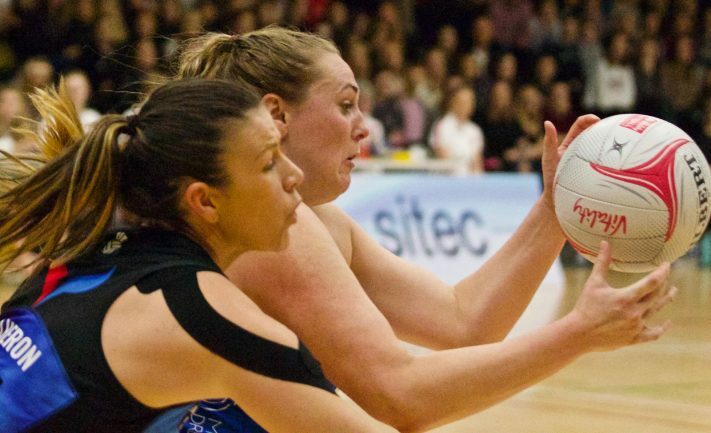 Guthrie was the only change to Saturday’s starting seven against Celtic Dragons but, as in that match, Team Bath struggled to make the most of turnover ball in the first period. The Sirens attack of Bethan Goodwin and Niamh McCall were clinical at the other end and it was the visitors who went into the break with an impressive 15-9 lead. Team Bath were having to really work hard to find space in the Sirens circle and there was no let up in the defensive pressure during a physical second quarter but the hosts, with the vocal encouragement of the crowd ringing in their ears, continued to battle away and began to reap some reward. A four-goal burst from Sophie Drakeford-Lewis saw Team Bath – who introduced Abi Robson at WD – cut the lead to two and that was how it stayed for the remainder of the half as the teams went blow for blow, with Sirens holding on to a 24-22 advantage. The visitors made the brighter start to the third period and stretched their lead to 28-24 but Team Bath were fired up now and, inspired by some stunning interceptions from Guthrie and Summer Artman, worked their way back into the match once again. With the ball now being fizzed in to Drakeford-Lewis and Kim Commane in attack, Team Bath had the crowd on their feet as they drew level at 32-32 before taking the lead for the first time since the second minute. They soon found themselves 35-32 up but Sirens were not going to let the match get away from them and clawed their way back to 36-36 with a minute of the quarter remaining. It needed another flying Guthrie intercept to regain the momentum for Team Bath and two Drakeford-Lewis goals ensured they led 38-36 going into the final period. It remained tense and tight in the opening stages of that quarter but, as Artman and Usoro-Brown turned up the defensive pressure, Team Bath were finally able to gain some breathing space. Rachel Shaw and Robson were also working tirelessly as the hosts saw out a hard-earned four-goal victory. The Blue & Gold are back at home on Monday (March 25) when they play host to South West rivals Severn Stars in a rearranged derby fixture. Centre-pass is 7pm and tickets are available at netball.teambath.com. Team Bath Netball starting 7: GS Kim Commane, GA Sophie Drakeford-Lewis, WA Rachel Shaw, C Serena Guthrie, WD Imogen Allison, GD Eboni Usoro-Brown, GK Summer Artman. Replacements: Leila Thomas, Abi Robson, Mia Ritchie, Laura Rudland, Beryl Friday. Changes: Q2: Robson – bench to WD; Allison – WD to bench. Strathclyde Sirens starting 7: GS Bethan Goodwin, GA Niamh McCall, WA Nicola McCleary, C Gia Abernethy, WD Claire Maxwell, GD Emily Nicholl, GK Hayley Mulheron. Replacements: Emma Barrie, Kelly Boyle, Ella Gibbons. Quarter scores (Team Bath first): Q1 9-15. Q2 22-24 (13-9). Q3 38-36 (16-12). Q4 51-47 (13-11). Genuine Car Services Player of the Match: Serena Guthrie.